Pink or Pork? What does that even mean? 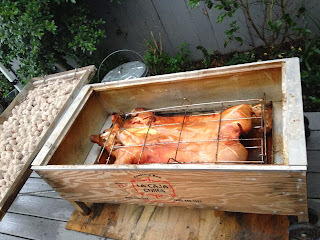 Pig Roast? For real? In San Francisco? YES! 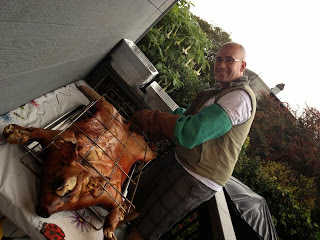 The Annual Rannels Family Pig Roast is our family’s celebration of all things pork related. We roast a whole pig in our San Francisco back yard and serve it to several dozen of our friends, colleagues, and acquaintances; celebrating fellowship with all who attend. Sounds pretty involved. Not that we don’t respect you, but are you really up for this kind of thing? It is pretty involved. But we are more than up for it. There’s a lot of planning and there are many, many lists. This is our SIXTH year and our FIFTH pig (one year we did ribs instead) and every year is better than the last. How do you do that in your tiny back yard? We roast the entire animal, all at once, in a device called a Caja China. Developed by some particularly motivated Miami Cubans, it not only cooks the meat perfectly, it also produces the crispy skin appreciated by people of refinement from Havana to Shanghai. It takes 4.5 hours and about 50 lbs of charcoal to do this. Neat! What can I bring? You don’t have to bring anything other than your appetite: we'll have lots of protein, some basic sides, the usual keg of Guinness, Jacob's American IPA, and a great big bottle of red wine flowing. But I never come to a pig roast empty handed! Yes! Especially if they like pork! Sorry, no. While our dogs - Indy and OOMA - are friendly and great with kids, it'd be rather problematic to have a new dog on the scene with all that pork around. Thanks for your understanding. I’m vegetarian/vegan/keeping kosher/only eating halal meat these days. Is there anything for me at the Pig Roast? We offer fellowship to all, and you are truly welcome to attend. But you may want to bring some of your own food to the festivities because, well, it is a pig roast. Wait. One more time. What's this Pink or Pork thing? Really? Pink or Pork is the successor to Pink or Punk. These are the ur-parties of old that, some say, laid the solid foundation for what we do today. At least that's what we tell people who weren't at either one.